You are here: Home / Uncategorized / Are you wearing shoes that are harmful to your feet? Are you wearing shoes that are harmful to your feet? Did you know that some shoes can cause more harm than good? Chances are, you’re wearing shoes that often cause foot and ankle problems, but don’t worry—we have some alternative solutions for your closet. High Heels – heels limit the motion of the ankles and joints when worn, thus creating a wide variety of foot and ankle ailments. Some of the most common effects include: Achilles tendonitis, hammertoes, bunions, plantar fasciitis, Morton’s neuroma and corns. If you have to wear heels, please limit the time worn. Also, incorporate plantar fascia and calf stretching exercises (check out our video library for exercises). Flip Flops– these summer staples for many people, are also one of the worst for your feet. Flip flops are thin and unstructured, offering zero support, leading to painful plantar fasciitis, tendon problems and sprained/fractured ankles. Ballet Flats – flats lack arch support and offer no room for custom orthotics. Ballet flats can also cause increased ingrown toenails because they can put pressure on the toes and cause the nailbeds to grow inwards. 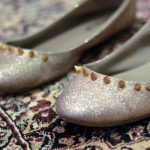 With no room in the toebox, and often leading to blisters on the heel or sides of the feet, ballet flats are not a good option for your everyday shoes. Uggs– Slip on boots with sheepskin lining are a major no no when it comes to winter shoes. Many people wear them without socks, which can lead to a build up of fungus because of the humidity created within the boot. Although they may seem comfortable for short periods of time, they are not made for wearing long periods of time or walking a lot due to the lack of arch and ankle support. Try this instead: Still want to wear your Uggs? 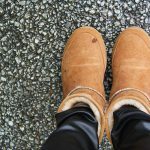 Add custom orthotics to your favorite pair of sheepskin boots and don’t forget to spray the inside lining with an anti-fungal spray once a month.